2 Bedroom, 1 1/2 bath with Forest Views. "Whiskey Me Away" is an authentic log cabin and the perfect getaway from the hustle and bustle of everyday life, yet only a short 7 miles from the Parkway. Visiting the Great Smoky National Park? We are minutes from the back entrance allowing you to avoid the traffic on the Parkway. Alpine Mountain Coasters, Coasters at Goats on a Roof, along with many local restaurants are nearby. 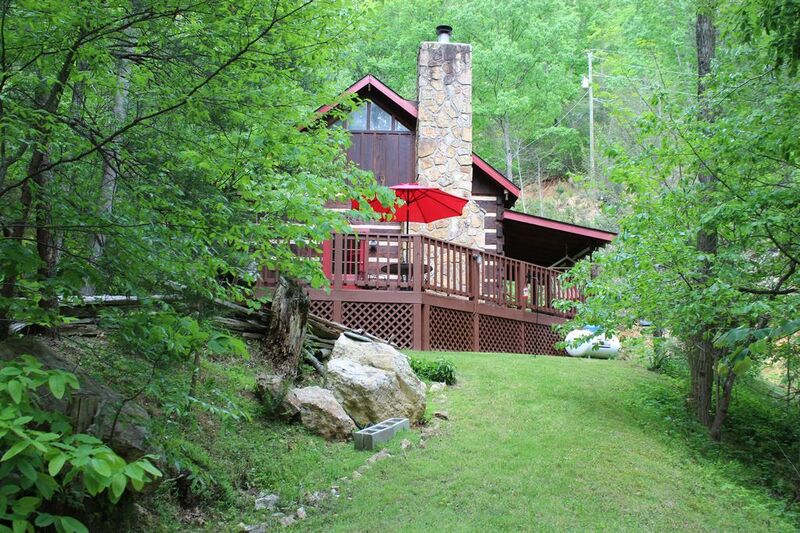 This cozy two story cabin is located in Wears Valley where you can enjoy the peace and quiet of the woods, while only a short drive to the major attractions. You will feel whisked away from it all as you enjoy your morning coffee on a private deck, in this secluded forest setting, or listen to the sounds of nature before embarking on the day's activities. After a full day of sightseeing, return to enjoy a soak in the hot tub or feast on an al fresco meal while looking at the stars. If you choose to stay in for the day, the cabin has WiFi, DVD movies or just curl up with a book in front of the cozy gas fireplace. This 2 bed, 1 1/2 bath cabin comfortably sleeps 4, with a fold down couch allowing sleeping for up to 6 or four adults and two children. WIFI, DVD player, movies to view or books to read are included in your stay. A lovely swing in the side yard or private porch provide a serene place to read, talk or contemplate. The kitchen is fully stocked with pots, pans, utensils, plates and cups. Coffee, creamer, and sugar are provided for the first few days of your stay. Board games, checkers, dominoes, playing cards. This was our 2nd trip to this lovely cabin. Our grandsons (ages 8 and 10) actually requested that we stay here again. It's perfect for us. We enjoyed our 2nd Thanksgiving here. This cozy cabin offers peaceful seclusion without being remote. The drive to the cabin is not the steep, treacherous roadway we have encountered at other cabin locations. In the heart of Wears Valley, we found good places to eat and fun shops to browse. The cabin was stocked with everything we needed. Bed was comfortable and cabin is clean and well maintained. Loved all the little signs....they said a lot about the love the owners have for this sweet place. It was our pleasure to spend a few days in Whiskey Me Away. We absolutely loved this cabin. We have made it a tradition in our family to try to get away to the mountains for Thanksgiving - we all loved this cabin so much that we hope maybe we can make it a part of our annual Thanksgiving tradition. There were so many little extras all throughout the cabin. You could tell the owners take pride in their property. Our grandsons loved the hot tub too. Also, the owner is a delight with whom to work. It was a pleasure to host you! We would love to host you again! You were a wonderful Guest, please stay in touch! We are so happy you enjoyed your stay. Thank you for being such wonderful guests. We always enjoy communicating and helping people enjoy much needed time off. We always feel we are on vacation when we stay at the cabin! We love the seclusion and feeling we are really away from it all! Thank you for kind words. I am glad you had time for relaxation. I too love my time just sitting on the porch, enjoying the sights and sounds of nature. Looking forward to your next stay! This list is meant to help you prepare your visit for the best possible weekend. Remember to check our map in Whiskey Me Away to find alternate routes to the Parkway and Cades Cove, in order to avoid some of the traffic snarls. Description: Dollywood opens for the 2017 season!